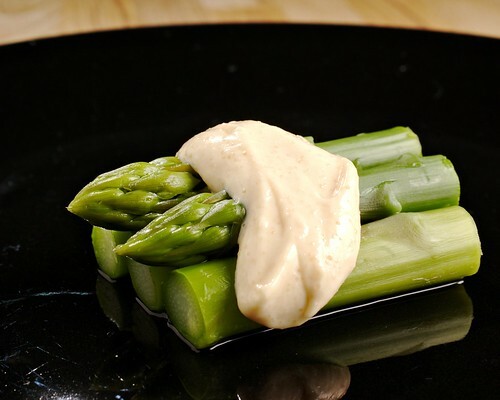 Anyway, I wanted to share with you a simple asparagus side dish we've been making lately, now that it's in season. It really is simplicity itself, with only three ingredients and almost no preparation time. Take some green asparagus - about two per person or so. Cut off the hard bit at the bottom (you can feel the hard part), then cut each stalk in four pieces. Steam the asparagus for a few minutes, until they're just getting soft. I guess boiling is fine too, we just haven't tried it. Check that they're done with a toothpick, and don't forget them, whatever you do. Soggy, limp overcooked asparagus is no fun. Cool them in cold water. Meanwhile, take some mayonnaise and either Swedish kaviar (salted, smoked cod roe in a tube) or Japanese mentaiko (marinated pollock roe) - the taste is surprisingly similar. Mix to taste in a small bowl; start with about a tablespoon of each, then adjust until you find a good balance between the creamy mayonnaise and the salty roe. Arrange the asparagus either all on one plate, or separately for each person. Dollop a bit of the mix on top, then serve.